Toronto FC’s all-time goal and assist leader is heading to Saudi Arabia. Sebastian Giovinco signed a three-year deal worth more than $30 million with reigning Saudi Professional League champions, Al-Hilal FC. Toronto FC acquired Giovinco from Italian powerhouse Juventus in January 2015, and took MLS by storm as he won MVP in his debut season. He scored 22 goals and added 16 assists in 2015 and led TFC to their first ever playoff appearance. Giovinco scored hat-tricks and numerous free-kick goals during the 2015 season, but his most memorable goal came in October against the New York Red Bulls which solidified them a spot in the playoffs. The goal was spectacular, but the narrative meant much more. Giovinco returned from Italy the day of October 14 after playing for the Italian national team in Euro Qualifying games. The game against the Red Bulls was that night, and he came off the bench to score one of the most important goals in TFC history. Giovinco’s remained consistent during the 2016 season, he scored 22 goals and provided 19 assists across all competitions. More importantly, he played a major part in TFC’s playoff run that saw the them make the MLS Cup final for the first time. They defeated New York City FC in the Eastern Conference semi-final, a match-up that included a 5-0 win in the second leg of the tie which at the time was their biggest margin of victory. Giovinco scored a hat-trick at Yankee Stadium that night. Giovinco also scored two hat-tricks during the 2016 regular season. Compared to his first two seasons, Giovinco’s production slowed down in 2017 as he scored 20 goals and had eight assists across all competitions. Overall, 2017 was TFC’s best season as they became the first team in MLS to win the domestic treble, and also set a record for most points in an MLS season with 69. The Reds won the Canadian Championship, the Supporters Shield, and the MLS Cup that year. TFC’s 2018 season began in February because of Concacaf Champions league, which they defeated Mexican giants Tigres and Club America in the process. Giovinco scored a magnificent free-kick during their second leg against Tigres in Mexico. The Reds lost the final to Chivas Guadalajara in Mexico, but Giovinco was awarded the Golden Ball as he scored four times and assisted three during their run in the tournament. The 2018 MLS season did not go the way that Toronto FC wanted, as they missed the playoffs for the first time since 2015. It was reported during the middle of the season that General Manager at the time Tim Bezbatchenko and Giovinco were in talks to sign a new contract for the Italian striker, but nothing was agreed upon. In an interview conducted by TSN in January, Giovinco stated that both he and Jozy Altidore would like to finish their careers in Toronto. It turned out that Giovinco wanted to continue his career elsewhere, as he signed with Al-Hilal. 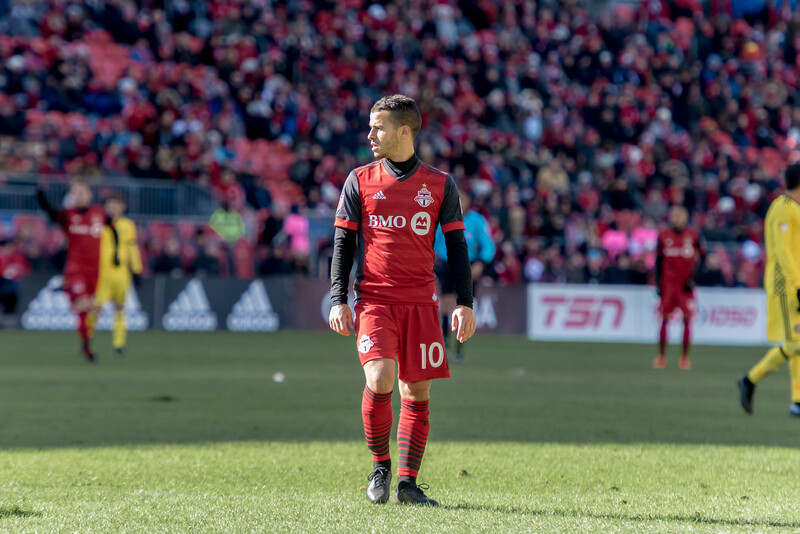 Giovinco took to Instagram to not only thank the fans, the club and the city, but he also criticized TFC’s management and their decisions of handling certain things. Sebastian Giovinco and Jozy Altidore both joined TFC in 2015, and formed a strong friendship on and off the field. Altidore displayed his sadness on Instagram and Twitter when it was announced that Giovinco was sold. Toronto FC will no doubt be in a rebuilding process during the 2019 season as they also got rid of goalkeeper Clint Irwin, midfield maestro Victor Vazquez, and Canadian striker Tosaint Ricketts. Gregory van der Wiel’s contract will be terminated after the Dutch defender was sent home from training camp in Los Angeles due to insubordination when he got into an argument with head coach Greg Vanney. As for Sebastian Giovinco, he leaves Toronto as arguably the club’s best ever player, and his presence on the field will be missed.